Beverly Hoffman, Ocularist | Ocular Prosthetics, Inc.
Beverly Hoffman-Fuglsby, B.C.O., B.A.D.O., became a Board Certified Ocularist by the American Society of Ocularists in 1986. She began her training as an ocularist with Robert Levy, O.D. in 1971. 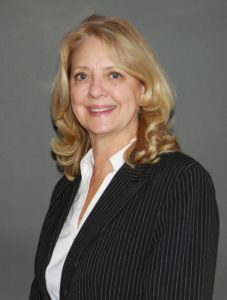 Beverly has brought over 35 years of experience to Ocular Prosthetics, Inc. and its patients. During this time, she has created a “family” experience among her patients by continuing the tradition established by the Levy era. Beverly Hoffman-Fuglsby is a true master at custom designing all types of prosthetic eyes. Her experience includes the fitting of every type of surgical implant from enucleation and evisceration surgeries, as well as scleral cover shells. Beverly is an expert with pediatric cases, including the fitting and prosthetic rehabilitation for congenital microphthalmia, congenital anophthalmia, and retinoblastoma. In addition to fitting prosthetic eyes, Beverly’s noted innovation includes the development of a rare two piece prosthetic eye used in extreme cases. Beverly Hoffman-Fuglsby has also made great advancements in the area of cosmetic optics, by designing and fitting soft cosmetic lenses. These advances have led her to create the eyes of many movie stars such as E.T. and several Star Trek cast members. Beverly is available to see patients in the Los Angeles and Orange office locations. Special arrangements can be made to accommodate patients traveling from long distances to complete the prosthesis in one day. To schedule an appointment, please fill out the form on the Request Appointment page.